Close your eyes, inhale deeply of the rich fine food aromas and you can imagine that you are back in the days of the fancy Italian ristorantes of Chicago in the 30's, 40's and 50's. They don't make 'em like this anymore. On the recent Saturday night we visited, the place was absolutely packed in both dining room and bar, yet the service was fine. And the food was superb and hot. Beginning with the complimentary slices of pizza appetizers through the entrees which come with side and soup/salad and through to the mouth-pleasing dessert, Sabatino's was delightful. Warm atmosphere in this place! Food choices a plenty and quality excellent - authentic Italian food like Grandma made. Prices totally reasonable/service outstanding! The very best Italian in Chicago, for the food, the atmosphere, and the value! Order ANYTHING at all and you will not be disappointed! With an entire upstairs private dinning area complete with bar, we host private events and parties for everyone. If you are interested in booking a private event with us, please call us (773) 283-8331 and book your event with Vickie, our special events coordinator. Please note, we book very quickly and may only be able to accomodate larger parties when we are most busy. We look forward to hearing from you! Come in for your next evening with us! Arrive early to savor a cocktail at our full-bar while listening to live piano music. Bask in the company of strolling musicians in the main room during your meal on certain evenings. There is always free complimentary valley parking! Sabatino's is an anachronism that's hipper than you'd give it credit for. It is a snifter of brandy, a velvet smoking jacket, Buddy Rich's drum groove on "Mercy, Mercy, Mercy." It is "exquisite" and "quality" spoken with a thick Chicago accent, dressed to the nines in a bow tie and tuxedo vest. It might also be voted Chicago's best restaurant if AARP The Magazine held a write-in poll, which is to say, the median hairstyle in the dining room is coiffed white. Sabatino's — Old Irving Park's venerable Italian restaurant for 40-plus years — has a menu reflecting its clientele's enduring tastes, with the kind of dishes sadly going the way of the dodo: shrimp DeJonghe, oysters Rockefeller, cherries jubilee, among other chestnuts. The restaurant is so old, in fact, that co-owners (and brothers) Angelo and Enzo Pagni can't nail down an exact date, though they believe it's 1969. Back then, said Sabatino's office manager, Vickie Van Hove, "it was a spaghetti and meatball kind of place, nothing like it is now." The Pagni brothers took a long boat ride from Genoa to New York City in 1966. Chicago was their destination. They were practically bambinos when they started cooking at Italian Village. After stops at other restaurants in town, they took over Sabatino's on Jan. 1, 1978. The key, Angelo Pagni said, was cooking a dish on that first day and having it taste exactly the same 33 years later. Customers here don't seek progress or innovation. They want reliability and nostalgia. "We have regulars who drive 30 miles to our restaurant, and that's a long way to come," Angelo Pagni said. "They make the extra mile to see you, you better be on the ball." If you grew up in Chicago, Sabatino's was probably your first exposure to fine dining at the $30-an-entree level, and your grandparents likely brought you here. You're greeted at the door by neoclassical Grecian statues, because in the '70s they were the embodiment of interior decorating chic. Then you notice the fake bunched grapes, wine barrels and Christmas lights hanging on walls and you think, "Boy, this is some classy joint." Original article by: Chicago Tribune. 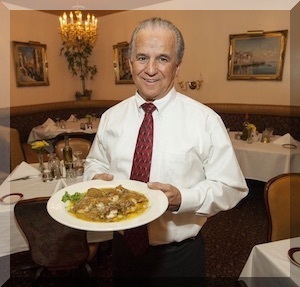 Nestled in Chicago’s storied Old Irving Park neighborhood, Sabatino’s has been catering to its guests with authentic Northern Italian cuisine for over 30 years. Whether you’re craving the perfect pasta dish the way your Nonna used to make it or a well aged prime cut of Filet Mignon, this Chicago standby will deliver with courteous service and attention down to the finest detail. Come experience fine dining the way it was meant to be. 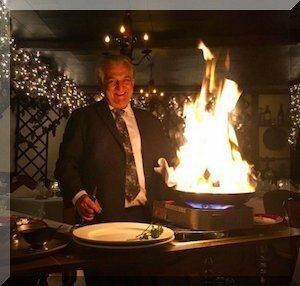 With candle-lit private booths for that perfect romantic evening and ample space for family get-togethers, Sabatino’s is the perfect place to celebrate any occasion with elegance, style, and mouthwatering fare! Be sure not to miss the strolling musicians crooning Frank Sinatra and Dean Martin during the week, or the live Piano Bar on Fridays and Saturdays. One trip to Sabatino’s and you will have no doubt where you are truly treated like family. Remarkable tradition kept alive. Onwer/Cook Angelo cooking up Steak Diane!